Continuing with our Cambodian experience, it is almost impossible to avoid learning more about the atrocities that took place in Cambodia from 1975 to 1979. At the same time that the first Star Wars movie was released, Margaret Thatcher became Prime Minister of the UK, and North and South Vietnam joined to form the Socialist Republic of Vietnam, Cambodia experienced a horrific period which saw between 1.4 and 2.2 million, or 25% of the population murdered by Pol Pot and his Khmer Rouge regime. The consequences of this period of time are inescapable and there are many much better placed websites to learn more about the Khmer Rouge, however the book ‘First they killed my father: A Daughter of Cambodia Remembers’ by Loung Ung is the real life account of a young girl who experienced the murderous regime first hand. 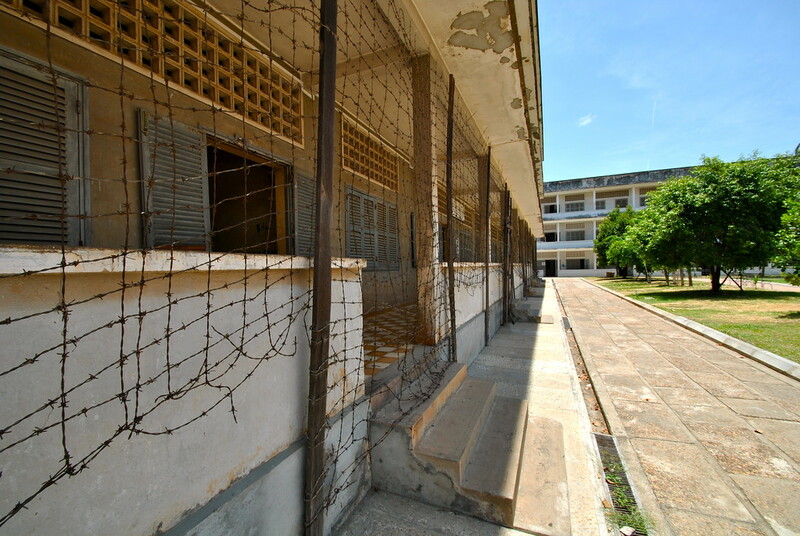 What follows are our thoughts and experience of visiting the S-21 prison, an infamous institution where between 17,000 and 20,000 people were incarcerated and tortured before being murdered in the nearby Killing Fields between 1969 and 1975. Arriving at the prison, we were instantly shocked by its location and close proximity to Cambodian suburbia. It’s hard to imagine the horror of what occurred here, within feet of nearby residential streets. But then the location makes sense when you realise that the prison originally was a school. Cambodia doesn’t hold back from explaining the horrors of its recent history. There is no sanitisation of what occurred here, no dumbing it down. As we walked through the prison, we entered each room silently, unable to skip a room. We had to look in all of them, after what occurred here it seemed wrong not to. As we entered the first building, we entered the first door on the ground floor. A small room, it was bare and decrepit save for a rusty old bed frame, a bucket and some tools lying aimlessly on the floor. We glanced to our left, and quickly realised what occurred here. On the wall to the left hangs a photo of the room when it was first liberated. The room in the photo looked as it does now, save for the body lying half on the bed and half on the floor. The day the prison was liberated, there were 7 survivors out of the 17,000 – 20,000 that entered the prison. Sadly for the occupant in this room, the liberators arrived only hours too late for the poor soul. Glancing back from the image to the room, we could see the bed frame was the original frame from the photo. The bucket, first assumed to be a toilet, is quickly revealed to be a vessel to carry bodily fluids and organs from the room as they were removed during torture. 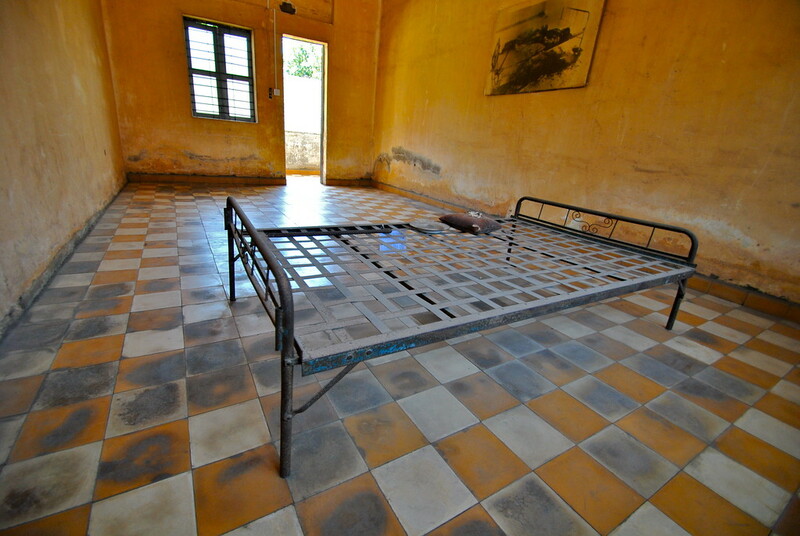 The ‘tools’ lying on the floor the main weapons to achieve the goals of the Khmer Rouge. As we wandered to its neighbouring room, a growing sense of unease came over us. We felt hot and nauseous, and entering the second room was much like entering the first. A solitary rusty bed frame, a bucket and some tools. Again the image on the wall to our left revealed the state of the room upon liberation, the same story as the previous room. And so on to the next room and the next. After going through the ground floor rooms, we went up to the first floor to the next set of rooms. And up again to the next floor, and this was only building one. 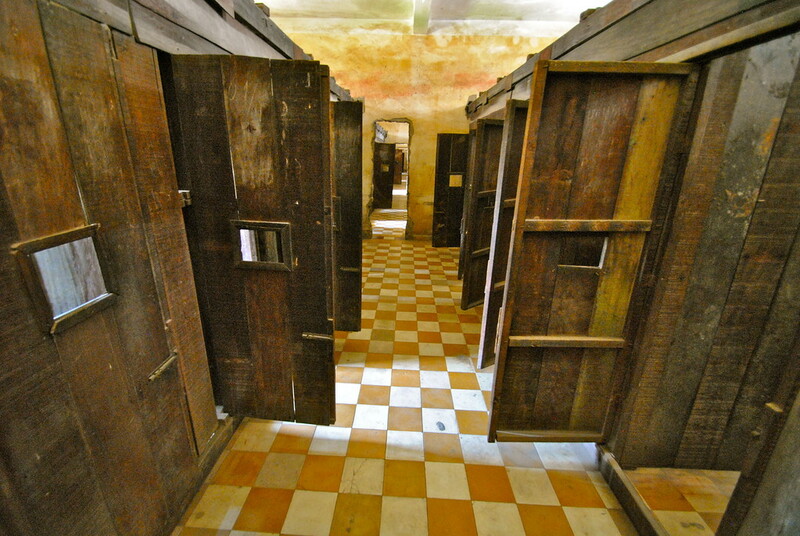 The first rooms we visited were torture rooms, the second floor was more of a holding cell for the ‘guilty’, with guilty meaning anyone the regime didn’t trust: educated people, intellectuals, members of the previous government and police force. 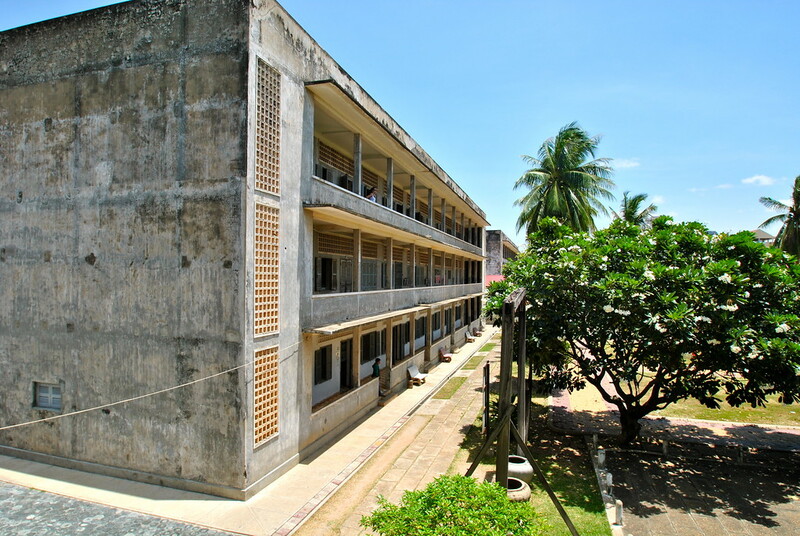 The Khmer Rouge wanted to eradicate intellectuals, turn the population into an agrarian society and control the poor and uneducated. The conditions these people were subject to were horrendous. 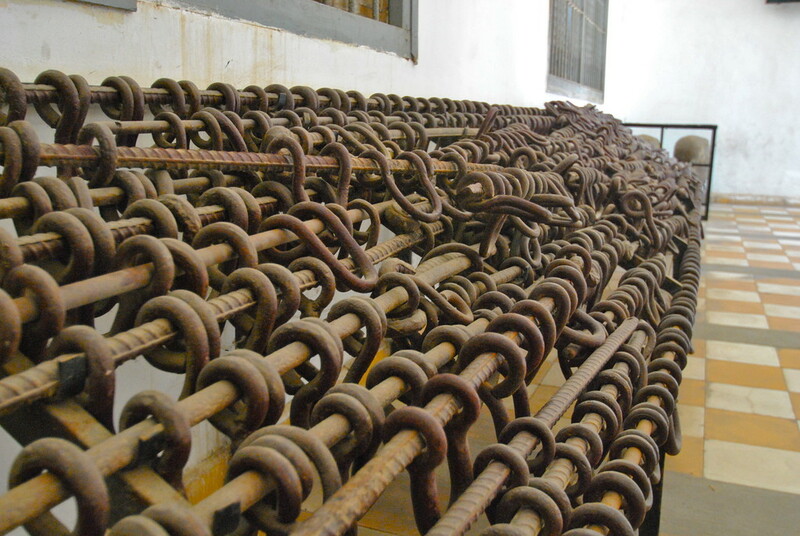 Chained and manacled to the floor in long rows, inmates would lie there all day and night, unless they were asked to stand for whatever reason the guards deemed. We knew what happened in Cambodia was horrific, but to walk through a building which played host to these atrocities barely 40 years previously disgusted us. But yet we had to see the rest of the prison. 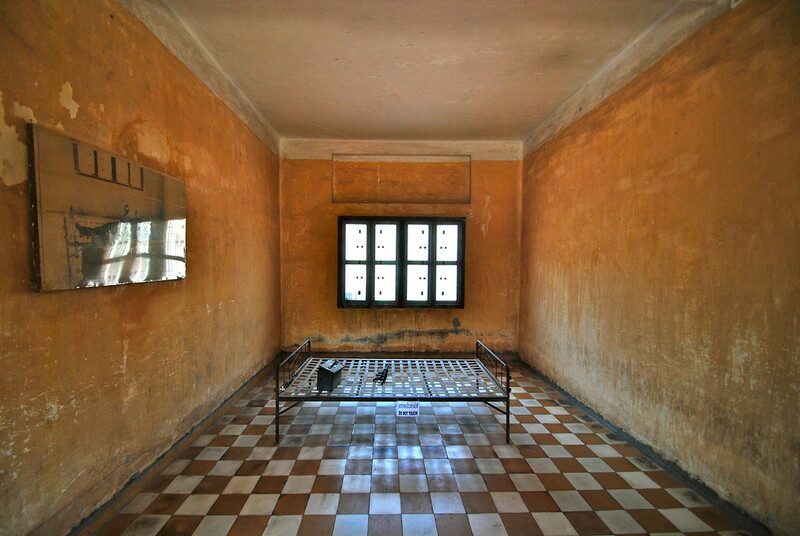 The second building was much of the same, the larger rooms showed us the faces of the victims. 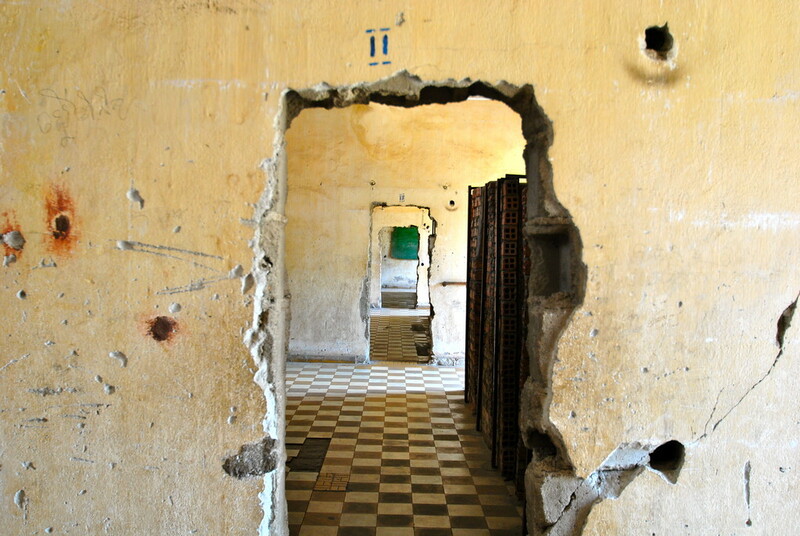 The Khmer Rouge, much like the Nazis, had been meticulous in documenting their killing. Every person that entered the prison was photographed and documented, and here they were, staring back at us. Hundreds of photos lined up in rows, many of them children.All with different expressions; some were fearful, some confused, some unaware of what was taking place, and those who were resigned to what was about to happen. Horrifying to see, but as we mentioned earlier, there is no sanitising the story of what happened here. The faces of the guards of the prison were also revealed to us, very young individuals given the brutal task of torturing and murdering fellow countrymen. We stayed at S-21 for a couple of hours, looking at and reading every last morsel of information on offer. And then we left, back into suburbia of Phnom Penh. Back to our friendly tuk tuk driver who muttered “not a nice place yes?” before taking us away from S-21. It was a harrowing experience, but also an unavoidable one on a journey through Cambodia. Wow I hadn’t heard of this prison or tour, but will be visiting for sure while I am in Cambodia. I just now finished reading “Frist they killed my father”. Oh man that book is so powerful, I cried so much and just couldn’t believe that at that day & age the world allowed this to happen. Looking at the photos and reading this post I can only imagine what happened in there and the thought of visiting makes me want to cry, but I know I must. I know I must learn more and share it with the world as well. We can’t allow history to repeat its self. Thanks for writing this. Thank you for your kind comments Jaime, we read the book when we were in Cambodia and knew we had to go and visit these places, no matter how awful they were. We’re still astonished by what happened there relatively recently, and as we moved through south east Asia we learnt more and more about the turbulent last 50 years or so in the region, and all the events leading up to them. Thanks for commenting again, hope you have a great trip when you get there, its a beautiful country. Wonderful post and photographs. I visited the museum today too and was overcome with such terrible naseaua that I had to leave. I would look in a few of the rooms and feel so sick I would have to walk outside and sit down for five minutes before continuing. I have never felt so sick. A terribly sad and horrifying place I was deeply saddened by the experience. Thanks for stopping by Charlotte, we felt the same as well – it’s such an unnerving place. We felt as though we had to continue through all of the buildings just to see it all, but we felt quite sick as well.